We supply high quality wheels and castors to various industries, for multiple application. 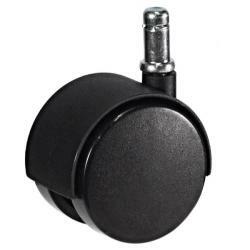 Both plastic and rubber chair castors are available, our 50mm black nylon chair castors, have both complete nylon or rubber tyred options to choose from. The rubber tyred castors are non marking, ideal for laminate flooring. 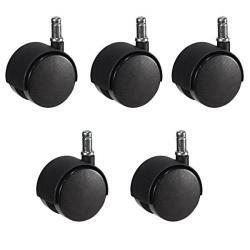 Swivel castors are designed for use on regular moving applications including hospitality equipment, retail clothing rails, office chairs and much more. Easy smooth mobility is essential when moving a weight from place to place regularly. Our office chair castors are easy to fit, simply place the chair base onto the castor knock in stem and ensure the castor is fitted on securely. Our twin wheeled castors are a regular 50mm, able to withstand a weight capacity of 45kg to suit the majority of requests. 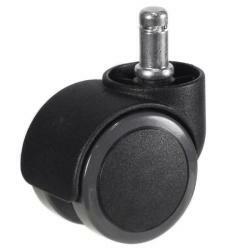 We can provide either individual office chair castors, or castors in sets of 5 for great prices. Our castor and wheel range has been developed over many years, with the help of our customers and suppliers feedback. If you would like to find out more about our rubber chair castors, simply contact us and speak with a member of our team today for advice about selecting the right wheels and castors for your application. Further specifications can be seen when product images are selected.